To be fair to these artistes, their sounds and images are often being pressed on them by their record labels. Thence, creating a certain persona – an individual who grew up in the ghetto and had to delve into/overcome a life of crime, women and drugs to get away from poverty – a sensational story that gets the attention of the public. The music industry is all about business after all and money has to be made. As a result, rap artistes end up projecting an image of a self-made successful individual who started from humble beginnings to get to where s/he is today. 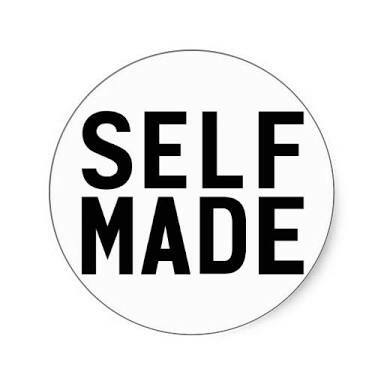 The self-made man is the ideal of the American success story; the core of American ethos. This explains why Jeb Bush, a former two-term Governor of Florida State, son and brother to former Presidents of the United States and grandson of a (long-term) United States senator, played the self-made success card when he unsuccessfully campaigned for the Republic Party Presidential candidate nomination early this year. I found it ridiculous and funny; a classic case of delusions of grandeur. This is someone whose first job after University graduation was with Texas Commerce Bank, partly owned by his father’s friend, James Baker. He may fail to acknowledge it but his background played a huge part in his success. It got me thinking about the world’s fixation on producing self-made men and women. The world is awash with stories of self-made millionaires. But is it really possible for one to get ahead in life without external help from others? I sincerely don’t think so because we live in a world that is inter-connected and inter-dependent. Rather, I think the theory of self-made man is an ego-fuelled illusion coated with falsehood. Certain factors, outlined by Malcolm Gladwell in his book, Outliers: The Story of Success, play both positive and negative roles in one’s success journey. These factors include environment (when and where you were born and raised), parental upbringing (what your parents did for a living and circumstances surrounding your upbringing) as well as culture (inherited traditions and attitudes). I am not trying to playdown the essence of hardwork, effort, talent, determination, or mental strength in our success pursuit. These are all core ingredients of success but the aforementioned factors afford us an opportunity which only the prepared ones like Buffet (who possess the core success ingredients) take. Take for example, parents, family members, communities, guardians, Government, Scholarship boards and philanthropists pay the school fees of many students but the onus still lies on the students to put in the hardwork and effort to graduate. Those who pay the school fees create the opportunity for good education whilst the prepared student takes it with both hands, studies and graduates. Another classic example (for football lovers) is the story of Marcus Rashford. The then 18-year-old was given an opportunity by erstwhile Manchester United manager, Louis van Gaal, to make a name for himself in a crucial Europa League encounter. The prepared youngster took the opportunity with both hands, scoring a brace in the match as his team ran out 5-1 winners against Midtjylland on the night.